KIDS FIRST! Film Critic Samantha M. comments, “Summer is just around the corner, and there’s no better way to start it than by watching this alluring animated film. I could not stop smiling the entire time, because I felt as if I was at the beach, enjoying my summer vacation.” Morgan B. adds, “Surprises, mysteries and new things to explore sounds like a lot of fun for the Boxcar Children so I suggest joining them on this new adventure to a mysterious island. I really enjoyed the funny characters, amazing animation and unique story line – all of which bring this film and its story to life.” See their full reviews below. tter ay to start it than by watching this alluring animated film. I could not stop smiling the entire time, because I felt as if I was at the beach, enjoying my summer vacation. With humorous jokes, unexpected challenges and adorable animals, you will become captivated for the full hour and a half. If you are trying to figure out your fun plans for summer vacation, all you need to do is watch this film. The Alden children have just begun their summer vacation and are truly ecstatic. 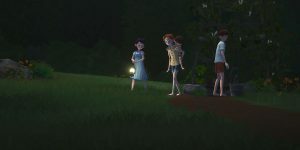 After running home joyfully to see their grandfather, the kids are presented with exciting news – they are going to spend summer break on their grandfather’s secret island. Little do they know, their summer will be filled with marvelous adventures, since they have to do everything on their own. But, the kids end up meeting a boy living on the island named Joe, who has a hidden secret. Join Benny, Henry, Jessie and Violet (four orphaned brothers and sisters) as they have the vacation of a lifetime. Benny, played by Carter Sand, is such an optimistic, inquisitive young boy. He always wants to help his family, such as asking to drive his grandfather’s boat. Jessie, played by Joey King, is a responsible girl with a big heart. She looks out for Benny and gives him his teddy bear when he needs it. I admire her compassion, because she exemplifies the perfect sister. John Alden, played by Dane DeHaan, is humble and thoughtful. He plants an entire garden for the kids to admire. I cannot wait to have my own garden when I am older. The animation is impeccable. For a few moments during the film, I felt as if I had time traveled from the movie theater to the beach. I could not help but envision myself next to waves, listening to the beautiful sounds of nature. My favorite part is when all of the kids make their own first dinner. Once they sit down at the table, they begin feeding their dog some bread. This is hilarious, because it reminds me of how I always feed my dogs extra food. Dogs are adorable, and, no matter how much food you give them, they will always beg for more. The message of this film is that when you work as a team, anything is possible. No matter what challenges there are in this world, you can transcend them. Life is short, so we need to make the best of it. Next time you feel that the world is not on your side, just remember that everything happens for a reason. These kids teach us to enjoy summer vacation and to never give up. If they can do this, so can we. Surprises, mysteries and new things to explore sounds like a lot of fun for the Boxcar Children so I suggest joining them on this new adventure to a mysterious island. I really enjoyed the funny characters, amazing animation and unique story line – all of which bring this film and its story to life. One thing that is mind blowing about this film is the animation. While I watched it, I noticed all the tiny details and how lifelike the characters look. I believed multiple times that I was actually exploring the island with them and felt like I was part of the action. The animation is that good. There is lots of eye candy to look at with great depth so it almost seems to be in 3D even though it isn’t. This makes the film very enjoyable and it widenes the age rage so older kids would enjoy it as well as younger ones. Carter Sand as Benny is just adorable. He is very quirky and reminds me of my younger friends. I also like him because he is good hearted and loves his siblings as much as the whole wide world. That is a trait that I think we all should share. J. K. Simmons as Dr. Moore is superb. I did a Farmers commercial once with Mr. Simmons and found him as charming off screen as on. He was an absolute pleasure to work with. Joey King as Jessie is a smart, lovely young lady. I have interviewed her many times and she is just adorable and personable. The only difference is that last time I saw her she was wearing reindeer ears and in this film she is the older sibling who knows how to cook. I like seeing her cook delicious foods from scratch such as clam chwder, cooked peas and carrots, apple pie and other foods. It made me hungry for dinner. Martin Sheen as James Alden plays a gracious and kind character. Everyone would love a grandfather like him because he is so kind to others, especially his grandchildren. He is willing to do anything to make them happy and even takes them to a special island for the summer. That is what I call great grand parenting. One thing that I don’t like about this film is that the story is sometimes way too slow. Also, they have a mystery that they discover that goes unsolved. It is weird that the story didn’t pursue that. It showed up and then they just dropped it. Other than that, the film is adorable and has a lot heart for families. I recommend this film for ages 5 to 12 and give it 4 out of 5 stars. This will play in more than 700 theaters as an after school screening on May 8, thanks to Fathom Event. So, go check it out!